With much of the country deep in the clutches of a brutal winter, I thought I’d toss out a few bushcraft and survival-related flicks to consider while hunkered down on the couch while the howling wind slams down the powder against your abode. The perfect movie to help fend off cabin-fever. Tom Hanks in a groundshaking look at solo survival in the Pacific. 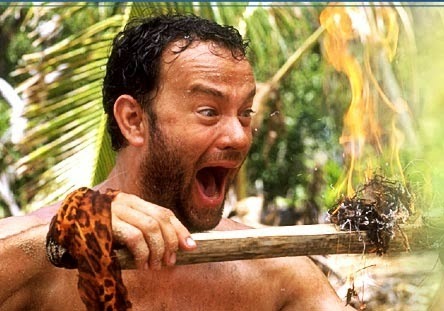 What’s not to like about Hanks cursing at his Wilson volleyball, his primal joy in creating fire by friction, and his ultimate return to the world. Not many viewers are aware that script-writer William Broyles (who also penned Apollo 13 with Hanks) spent time on a desert island in Baja learning castaway skills with primitive technologist Steve Watts and company. During their training, a bunch of “junk” washed up on the beach one day and they found a box of Japanese videotapes, a pair or ice-skates, and….a Wilson volleyball. Actor Emile Hirsch wistfully portrays the fate of Chris McCandless who perished from starvation in Alaska after a months-long solo trip ended badly. I liked the movie better than the book and chunks of it were filmed in my backyard in Arizona. I had the good fortune of taking Emile Hirsch out for a 3-day training course prior to filming and he was a cool, laid-back dude who was clearly intent on his craft. I’ve written before about our outing in my book, Life Under Open Skies and Emile portrayed the challenges of living off the land extremely well. I’m still astounded at how deeply this story runs through youth culture in our country and many of my college students still bring up the McCandless story around the campfire. McCandless’s sister just came out with a book recounting her experiences growing up with her brother and what may have led him to the path he took in Alaska. Based upon one of my favorite authors, Canadian writer Farley Mowat, this movie was adapted from a short story called “Walk Well My Brother” in the book, The Snow Walker. 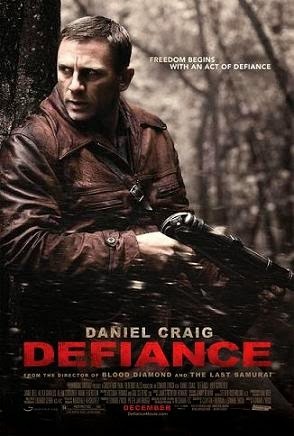 This movie was instantly praised within the survival community as getting it right, as far as having realistic skills and the power of mental attitude in overcoming adversity. A truly poignant and moving account of one man’s efforts to save himself and the young Inuit girl in his care after their plane goes down in the tundra during the 1950s. Some of the best acting, scenery, and storyline you are likely to see in a movie. Next to Jeremiah Johnson, this is the other movie I always recommend to students of mine. Pick up a copy of Mowat’s The Snow Walker book and read the other amazing tale, The Blood in Their Veins for a story you’ll never forget. I read the book on Tuvia Bielski years ago and eagerly awaited the release of this film with actor Daniel Craig (007) which he said was one of the most profound roles of his life. The Bielski brothers kept their group of over 1200 people alive in the boreal forests of Belarus during WWII while evading Nazi troops, tending to illness, rearing kids, finding food, and coping with brutal winters. If you get this movie, check out the special features which has interviews with the present-day descendants of the survivors and the Bielski brother’s own kids who served as consultants on the film. I went to a talk in Flagstaff a few years back by Zvi Bielski who is the son of Zus Bielski (played by Liev Schreiber in the movie). The book by Peter Duffy, “The Bielski Brothers” was recommended above others by Zvi. You can read more from my previous blog posting on this but be aware there are spoilers. After I left the theater and, later after hearing Zvi’s presentation, I kept thinking, “What the hell do I have to complain about in life?” This is a truly astounding film experience about the triumph of the human spirit. I remember reading about this story in the news when I was a kid and later read the book on the harrowing and horrific story about the Andes plane crash survivors. This movie, with actor Ethan Hawke, was made with one of the actual Uruguayan survivors, Nando Parrado, serving as a consultant so the details are spot-on from what Parrado indicated. The movie recounts the story of the ill-fated rugby team who crashed in the Andes in 1972 at 11,000 feet and whose 16 survivors had to endure 72-days of bone-numbing temperatures along with having to make the decision to consume their own dead. After several decades of indecision, Parrado eventually wrote a book about his experience which should be required reading for anyone involved in not only survival but leadership, crisis management, disaster planning, or anyone who wants to learn more about survival psychology. See the movie and then watch the hour-long documentary- Alive: 20 Years Later. If there’s another film that should be on the list, send me an email.